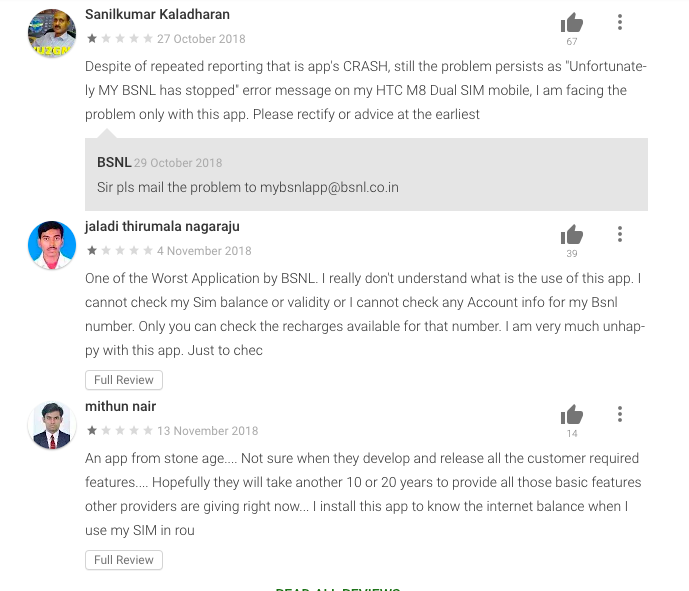 BSNL's new mobile app has already crossed 5 million downloads. State-run BSNL has announced an exciting offer for all: Get one GB of data, just by downloading their app. Every BSNL user is eligible for this offer, and there are actually no rules. How Will I Get The Free Data? As soon as you download the app, BSNL will automatically credit 1 GB to your account. Now, it won’t be visible right away, but can be used once your base plan has exhausted the data. For example, your Rs 171 per month plan gives 2 GB per day, and you happen you consume the data at 8 PM. In this case, this free 1 GB data will be applied to your account, and you can continue using data. Regular alerts will inform you, when the backup data is consumed. Bill payments for postpaid service of GSM, CDMA, Landline and WiMax. One-stop source to check all previous bill payments, and current bill. Only Credit card, Debit card and Net banking facilities are available. Top-ups and recharges for prepaid services can be availed. Migration vouchers can be purchases. The app was actually launched on October 25th, and has already 5 millon downloads. Hence, if you are a BSNL user, chances are high that you must have already downloaded it. However, there are few negative reviews, about bugs and crashes. Here is the first review which is showing right now, posted on October 28th, with 67 upvotes. Overall, out of 75,766 ratings, the app has received 3.75. If you have downloaded the app, then do share your experience with us, by commenting right here! Huawei Mate 20 Pro vs iPhone XS vs Galaxy Note 9: The Ultimate Flagship Champion Is…? Airtel Will Ditch 3G & Focus On 4G, 2G; India Has Worst 4G Speed! MNP numbers thin : Vodafone thrives, Reliance falters !